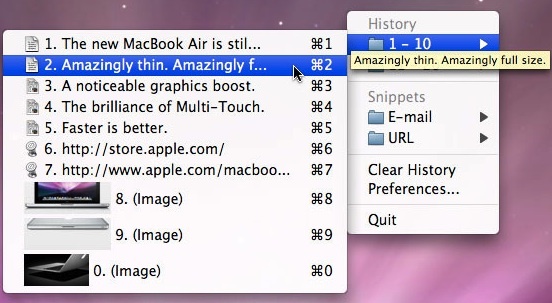 ClipMenu is an awesome free clipboard history manager for Mac OS X that keeps track of nearly anything copied into the clipboard, ranging from plain and rich text, URLs, images, even files. ClipMenu defaults to remember 20 items but can be set to whatever you want, each clipboard item is then stored for easy retrieval from the menu. Just select an item from the menu and it gets copied into your active clipboard buffer ready to be pasted or used elsewhere. Rather not add another menu item to OS X? No problem, you can have ClipMenu enabled but the menu hidden, instead opting for the history manager to be accessible via a keyboard shortcut instead (default is Command+Shift+V). Hit the key combo and a contextual menu will pop up anywhere the mouse is located. The app also supports saving “Snippets” of data that you use or access frequently for pasting, these are stored outside of the standard clipboard history and can be also be retrieved by a keyboard shortcut. ClipMenu is powerful yet easy to use, and surprisingly customizable, right down to the menubar icon itself. It even works fine with the command line pbcopy and pbpaste tools. 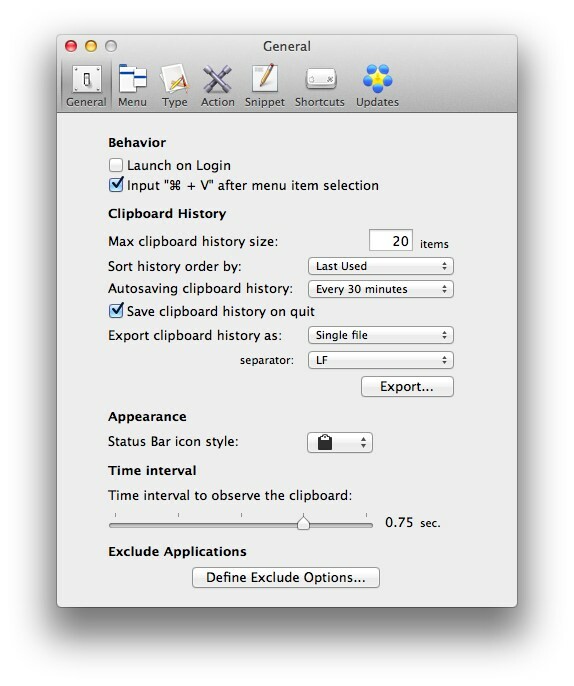 If there is a better clipboard manager for Mac OS X, I haven’t seen it. Do yourself a favor and download ClipMenu, set it to launch at Login, and never lose another copied item to the clipboard again. I prefer Jumpcut (http://jumpcut.sourceforge.net/) because of its “pop-up bezel”. Happy New Year to all osXdaily readers !!! I’ve tried them all and this one is by far the best! Especially if you need to have quick access to something that you copied and don’t have access to, from last week for example. I tried so many and found CopyPaste far and away the best for so many reasons. I like Clyppan also… no bloat. Minimalistic. Just plain and simple, does what it has to do.